The house sparrow is not native to North America. It was introduced in the late 1800's and has spread across the continent. Like our native cavity nesting birds it readily uses bird houses for nesting. The house sparrow is a very aggressive species that will prevent native Cavity Nesters from nesting successfully. Many native cavity nesting birds which normally use natural cavities for nesting will use Nest Boxes (bird houses) for homes. But the introduced house sparrow will also use nest boxes and therein lies the problem. The male house sparrow selects the nesting cavity and defends it ruthlessly. He will drive away a pair of potential native nesters, like bluebirds. He will also attack and kill adults and nestlings, as well as destroy eggs. The house sparrow has caused the decline of many of our native cavity nesters by out-competing them for nesting sites. The house sparrow is found across Kansas and North America. They tend to be found wherever there is human habitation. Farms, cities, and suburbs always have house sparrows. If you are at least half a mile from man-made structures there tend not to be any house sparrows. If you locate nest boxes away from human habitation, house sparrows may not be a problem for you. Because it is not native to North America it is not a protected species. House sparrows can legally be trapped and killed. Eliminating them from the local population is the best and often the only way to allow our native cavity nesters to successfully raise broods of young. In Kansas the house sparrow starts adopting nesting places as early as October and continues through June. 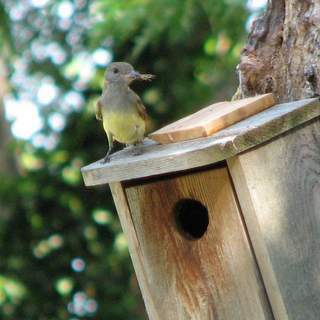 They are year round residents, so get a head start nest site selection before migrant birds have arrived in the spring. The male will aggressively defend a nest site against native cavity nesting birds like the eastern bluebird, tufted titmouse, tree swallow, and chickadee. Most of our native cavity nesting birds don't start searching out nesting locations until March through May. Furthermore, the house sparrow's local population is often so great that our native cavity nesters don't have a chance competing with them for nesting sites. If allowed to breed, they will return to the same site year after year. The will nest in buildings, crevices, and about any cavity they can find. It is important not to allow them to nest anywhere, as they produce multiple broods each year. The offspring become more competition for our native cavity nesting birds. If you aren't preventing house sparrows from nesting in your nest boxes/birdhouses, take them down or plug the holes. 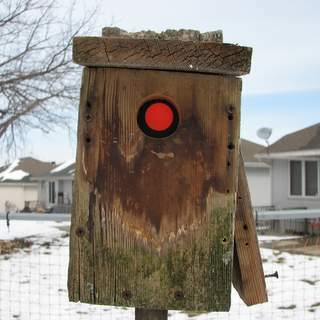 Nest boxes can be constructed with a hole diameter of 1 1/8 inches to prevent house sparrows from nesting in them, but this also restricts bluebirds and other native cavity nesters. A chickadee or house wren could use such a house. But house wrens can be very destructive toward other cavity nesters. They will pierce other birds eggs and throw the eggs out of the nest. I have had this happen in my own yard. I do not suggest using this technique as it only helps two species of bird. Chickadees and house wrens will still nest in boxes with a 1 ½ inch hole, which is the hole size I recommend for our smaller cavity nesting birds. Since 1993 I had tried to attract bluebirds to nest in my yard. Every year the sparrows were always successful at usurping the nest box from the bluebirds. I tried cleaning out the sparrow nests repeatedly. This may work to drive one pair of house sparrows away, but another pair of sparrows will fill the void. I also tried a slot box which was suppose to deter sparrows. They were not deterred and adopted the box readily. Neither of these suggested options worked. 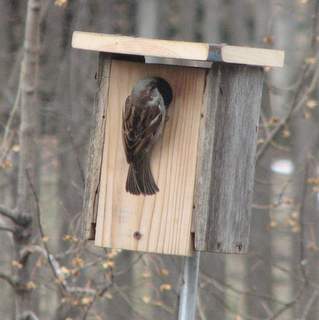 Finally in February of 2012, I learned of the nest box trap to catch and eliminate house sparrows. I immediately purchased one and started to catch the house sparrows. Not only was I successful in catching them, but I had bluebird raise two different broods of young. A house wren was also successful at raising a brood in one of houses. Unfortunately I met with one set back, a house sparrow destroyed the nest of the Great-crested Flycatchers that had begun nesting in my yard. I thought that they being larger birds could defend themselves against the house sparrow. I was wrong, and the house sparrow destroyed the eggs of the flycatchers. I've never had house sparrows kill cavity nesting birds in my yard but have witnessed it in nest boxes I monitor in some of the parks around Topeka. Sialis House Sparrow Attacks gives first hand accounts of the damages caused by House Sparrows to our native birds. There is not a next box design that will prevent house sparrows yet allow the same sized native birds to nest. I've tried the slot nest box, only to have the sparrows use it. If you are placing next boxes where there is human habitation, you will more than likely have house sparrows. But if your nest boxes are away from human habitat, sparrows may not be a problem. But you should still monitor your boxes for house sparrow nests. Repeatedly removing sparrow nests from a nest box may get them to leave that nest box, but they will just go to another nest box. This can be even more disastrous if they go to a house that already has a native cavity nester. They will destroy the eggs, nestlings, and sometimes kill the adults. Even if you drive one pair of sparrows away, another will come along and take over the nest box. It also does not work to allow the house sparrows to nest in one box thinking they will leave other nearby nesting birds alone. They see other nesting birds as competition and will destroy the competition. There is no way to deter house sparrows from using a nest box other than trapping and eliminating them. There is one solution to the house sparrow problem that works. It is trapping house sparrows using nest box traps and baited traps. The bluebirds can now nest in peace without the constant threat of house sparrows. This table reflects the number of house sparrows caught per year using both nest box traps and baited traps. I began trapping house sparrows in nest box traps at the start of 2012. At the end of 2013, I also began using baited traps. 2018 4 95 99 Continue with nest box & 1 elevator baited traps. Added shelter box to elevator trap. 2019 0 24 24 Continue with nest box & 1 elevator baited traps. Added shelter box to elevator trap. Table updated Apr 14, 2019. One solution to the house sparrow problem is trapping them in nest boxes. House sparrows seem to be attracted to nest boxes as early as October. The nest box trap captures the birds when they enter the nest box. They are not harmed by the trap. Once trapped and removed, they can be humanely killed, never to harm our native birds again. To trap house sparrows the nest box hole should be at least 1 ½ inches in diameter. Observe your nest boxes and when you see a male house sparrow at the box or entering the box, you know he has adopted that nest box as his own. You may see him singing and going in and out of the nest box. You may also see a female near the nest box. He will chase away any other birds that come near the box, because he is defending the house against all other competitors. This is the best time to set the trap to capture him. Learn more about purchasing and using a Nest Box Trap to capture house sparrows. Once trapped, house sparrows should not be released, but should be humanely killed. Euthanizing Sparrows & Starlings explains methods for humanely killing these invasive bird species. The European Starling, another invasive non-native bird, can also be captured with nest box traps. This video explains how to trap house sparrows in nest boxes using a nest box trap. I began trapping house sparrows in February 2012, when I had three bluebird sized nest boxes. Over the next year, I added three more to my yard. As of November 2014, my yard has 13 nest boxes that house sparrows try to use. Note that the number of birds caught in 2014 & 2015 was much less than 2013. I attribute that to the fact that I began using baited traps at the end of 2013. The number caught in 2016 and 2017 is quite small. This is probably due to trapping and eliminating breeding sparrows. Nest box traps work well during the breeding season but using baited traps during other seasons will help to control house sparrows. In December of 2013 I began using a funnel trap to catch house sparrows. In January of 2014 an elevator sparrow trap was implemented. 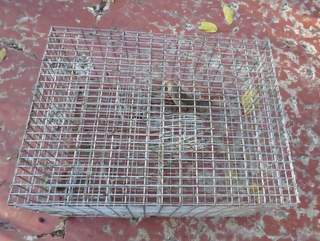 In October of 2014, I implemented the use of four different baited traps. 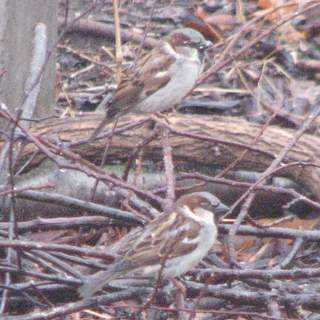 Fall seems to be the season when house sparrows begin to flock and start visiting my yard. I suggest to begin trapping in August. House sparrows are very fond of millet and that is the bait that is used in all of the traps. I've tried cracked corn and bread with less success. Do not use sunflower seeds as that will encourage more native birds to enter the trap. Don't supply any millet or cracked corn other than at your bait stations. Otherwise the house sparrows have no reason to enter the traps. Warning: Traps must be monitored at least hourly. Do not set any baited trap and leave it unmonitored. There is always the possibility of a native bird being captured. Birds left in a trap may die. If a native bird is captured release it immediately. Juncos seem to be the most frequently captured native bird in the baited traps. Sharp-shinned and Cooper's hawks are attracted to the live birds caught in these traps. They will land on these traps and try to capture the birds caught inside. Northern shrikes are also attracted to birds caught in these traps. Baited house sparrow traps are most successful if the traps contain live house sparrows that act as decoys. I prefer using female house sparrows as decoys as they are less aggressive than the males. I clip their wings in case they do accidentally escape. Clipping their wings makes it easier to distinguish the decoy birds from newly caught birds. Food and water should be kept in the trap to keep the decoy birds alive and well. I also cover the traps with a blanket at night to keep them safe from the elements and predators. Raccoons could destroy a trap if left out at night with birds in it. If it is raining, the traps should also be covered to protect the decoy birds. I've outlined the following styles of baited traps that I've used for catching house sparrows. The elevator trap operates using a counterweight. When a bird steps on the elevator, he drops down and exits through a trapdoor to a holding chamber. At the end of October of 2014 I implemented the Deluxe Repeating Sparrow Trap using millet as bait to trap house sparrows. I placed the repeating trap on the ground near some bushes. The best results seem to be achieved by using live decoy sparrows in the trap. I prefer using females to males as decoys as they aren't as aggressive. I clip their wings in case they accidentally escape. Be sure to include a water dish and to sprinkle millet in the holding chamber to keep decoy birds healthy. 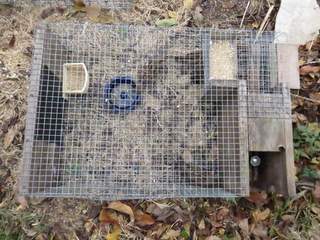 The trap should be monitored hourly while in use as native birds can be trapped. If a native bird is captured, release it immediately. When the trap cannot be monitored, just cover it with a blanket or tarp. Alternatively the bait can be removed or the counter weight can be removed. Another option is to wire the elevator open so birds can eat the food without being caught. This may improve your chances of catching trap shy birds as they grow accustomed to the trap. In 2018 I added a shelter box to the trap so that the decoy birds wouldn't get stressed and die. This was a fantastic addition as I was able to catch almost all of the sparrows visiting my yard. This video shows the addition in action. The elevator trap has caught more house sparrows than any of the other traps I've used. It's important to use decoy sparrows, bait it with millet, and locate it near some cover where sparrows like to feed. I caught 37 house sparrows from Oct 26 to Nov 12, 2014 in my yard. 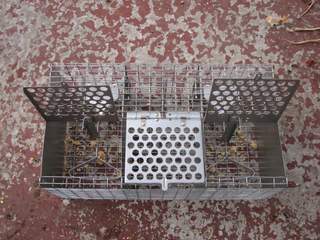 I also purchased the WCS™ Multi Catch Sparrow Trap to see how well it would work to catch house sparrows. It is a relatively small trap, measuring 16" long, 12" wide, and 8" tall. The entrances are truly funnel shaped, starting out wide and becoming narrower. This trap has two compartments. The first compartment contains the entrances to the trap. But once a bird enters the first compartment, they naturally fly up and find a tunnel to the upper holding compartment. I have had no sparrows escape this trap. The trap should be placed somewhere that sparrows are seen feeding. Sprinkle millet in the funnels and in the interior of the trap. Also sprinkle it outside the entrance to the funnels. Live decoy house sparrows should be used to attract house sparrows to the trap. Clipping the wings of the decoy birds is recommended in case they do escape. Place a water dish in the second compartment as well as sprinkling millet in the compartment to keep the decoy birds healthy. Monitor the trap hourly as native birds can be captured and must be released immediately. When the trap cannot be monitored, just cover the trap with blanket or tarp. The WCS Multi catch has worked well in catching house sparrows. I've never had a bird escape once they get in the upper compartment. I caught 6 house sparrows from Oct 26 to Nov 12, 2014. But in September, I took the trap to friends and caught 20 sparrows in two days. I built my own funnel trap based on the Brad Biddle Sparrow Trap. I made the trap with 30" x 10' bundle of ½" x 1" fencing purchased The following materials at Orscheln Farm & Home. The dimension of my trap is 21" long, 16" wide, and 7" tall. The two funnel openings are 3" wide and 2" tall at the entrance. The length of the funnel is 4". The end of the funnel has tips of cage wire that can be bent to narrow the entrance. One inch tall semi-circle fences are added to the ends of the funnels. A 5" by 5" door on the top is cut to allow removal of live caught birds. Wire cage clips are used to fasten the trap together. The clips and fastener are also available at Orscheln's. My trap varies from the Brad Biddle trap in having shorter funnel entrances as I found few birds enter a 7" funnel. If desired a cage latch can be purchased from Blu's Bird Toys. The latch makes opening and closing the door a cinch. The Biddle style trap has worked well in catching house sparrows, but birds can escape it. Therefore it's important to monitor it frequently and remove any captured house sparrows. I caught 15 house sparrows in December of 2014. 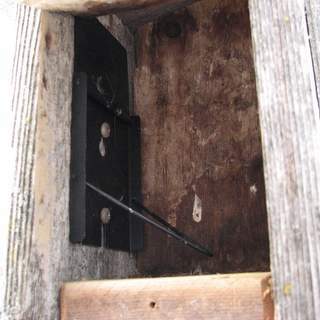 The trapdoor trap operates by the bird entering the trap, stepping on the trigger, which closes the top of the trap.The trap has 3 compartments. Two are trapping compartments and the third is for holding a decoy bird. 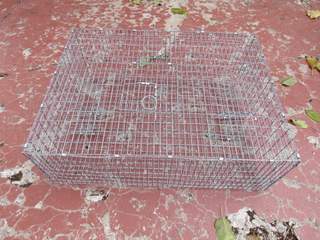 I implemented the use of this trap for catching house sparrows at the beginning of November 2014. My preferred bait for catching house sparrows is millet. But during nesting season feathers can supposedly used as bait. I have yet to try that. The trap I'm using is the Nature House ST-1 Sparrow Trap. A very similar trap is the Songbird Essentials SEST1 Sparrow Trap. Of all of the traps I've used to catch house sparrows I've been least impressed with the trapdoor style of trap. I've never caught a house sparrow in the trap. The Havahart model 1025 rodent trap can be used to catch house sparrows alive. I have not tested this trap yet as I have trapped all of my sparrows. This table reflects the number of sparrows caught by month using an elevator trap, funnel traps and a trapdoor trap. October through January appears to be the best months for catching house sparrows in baited traps. This is probably due to the fact that the number of juvenile birds is greatest at this time. If you want to share your experiences with controlling house sparrows or learn more from others, consider joining the House Sparrow Control Facebook Group.